“In Cotacachi, what do you do?” This is the most common question that I get from my friends and family in the states. For some reason, people seem to think that there is no life in our Ecuador living. Actually, I stay very busy when I am here and really enjoy visiting with my friends. 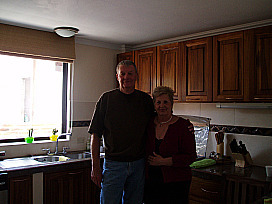 Jo and Bill are my friends in Ecuador. I am so happy to be able to call them my friends. They are a beautiful couple from Texas. Since they live in Ecuador year round, I am sorry to say that everyone really takes advantage of them. They are very kind and always eager to help everyone. I really do appreciate them very much. Cooking in Ecuador is a little different than it is in the US because of the high altitude. Also the stoves are different and a little hard to get use to. Jo has been cooking and baking here for quite a while so when I have questions, I ask her advice. She is sharing her coconut cake mix recipe with us. Thanks Jo for your recipe and my thanks to you and Bill for all you do. Preheat oven to temperature on the cake mix box; Grease and lightly flour a 9x13 inch cake pan. Bake cake according to directions on the cake box. While cake is baking mix the can milk and coconut milk. After cake is done and still hot, punch holes into cake using the end of a wooden spoon. Pour milk mixture over the cake and into the holes. Before serving spread Cool Whip on top and sprinkle with coconut. As soon as I arrived in this little village, word went around that a new shop open up. A fellow Foridian, Nancy opened up a “natural store” called Serendipity. I stopped in to say “hello” and found her to be a wonderful new friend. 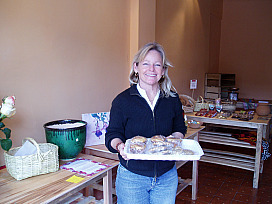 Nancy carries all natural cosmetics, food, coffees, teas, spices, nuts and much more. She will also be carrying ceramics and local paintings. She has a little table in the corner so all of us Americans piled around it. Nancy served us great meatloaf sandwiches. It was a good time! I spend a lot of time walking the village. Many evenings we will walk by a little restaurant called “Colours and Flavors.” (Many of us call it Jim’s Place because our friend, Jim is the one who discovered it and told everyone else.) Suzie and her wonderful family own the place and they have become our good friends. We all got hungry for an American hamburger so I taught Suzie how we like our hamburgers. Now it is on her menu. Anyway, they have good food and the most wonderful banana splits. I always thought of the banana split being an American tradition. Was I ever mistaken! Now I believe it is one of the South American recipes. Almost every restaurant here serves a banana split but I believe the one at Colours and Flavors is about the best. 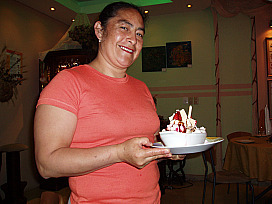 The homemade ice cream is delicious and it comes with bananas, sauces, cookies on top and more. It is just a good thing that we walk a lot in Cotacachi. This is a sample of our Ecuadorian living. If you get the chance, you should try it out. It seems that no one comes to Cotacachi and is disappointed. PUMPKIN PUDDING CAKE Socializing with friends is a great part of Cotacachi Ecuador living. This is a delicious recipe to serve to your guests. Cook pumpkin in water until tender about 15 minutes; drain thoroughly. Put pumpkin in saucepan and stir in cinnamon, sugar, heavy cream and 1 tablespoon of butter. Mash squash and cook over low heat until sugar has dissolved and mixture is fairly firm. Remove from heat and cool; add all remaining ingredients except reserved butter. Use reserved butter to grease 2 quart soufflé dish; pour in the pumpkin mixture. Bake in preheated oven at 350F degrees until cake is firm to touch about 1 hour. An ounce of rum may be poured over the cake while it is still hot if desired. Serve as a pudding from dish with whipped cream. This is a great snack for Cotacachi Ecuador living. Sift flour, baking powder and salt into bowl; blend in the cheese. Work the butter into the mixture with pastry cutter until crumbly. Blend in the pumpkin; pumpkin should make it moist but not sticky. Turn dough out on floured board and roll to ½ inch thickness. Cut dough into 1 inch wide strips 6 inches long. Form each strip in a ring and pinch ends together. Deep fry in hot oil (about 350 to 365 F degrees) until golden brown. Drain and serve with cinnamon syrup. Cinnamon Syrup: Combine sugar, water and cinnamon stick in saucepan.